KINGSTON, Jamaica, Nov 12 (Reuters) - Triple world and Olympic champion Usain Bolt received a diplomatic passport from Jamaica's Prime Minister Bruce Golding on Thursday. The 23-year-old received the document, which allows him to travel overseas as an ambassador-at-large, during a brief ceremony at Golding's Jamaica House office. "This is a big thing for me and I will try to do my best and will live up to your expectations," Bolt told Golding adocument. 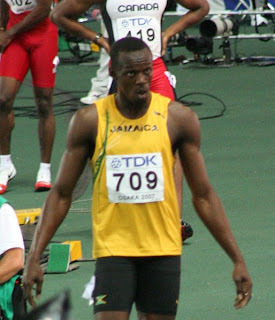 Golding praised Bolt as a role model who can continue to make Jamaica proud. "We have a great athlete, a great icon, someone who can help to strengthen Jamaica's image right across the globe," Golding said. The Prime Minister said the presentation of the diplomatic passport was not an award but a way of asking Bolt to help promote Jamaica's image overseas. "We want the world never to forget for one moment that he is Jamaican to the bone and he has so strengthened our image and is such a powerful symbol of what Jamaicans can become," he said. "We are asking him in his travels, whatever he does and wherever he goes, that he be Jamaica's ambassador and continues to bring glory to the country and makes sure that everyone understands that respect is due," Golding added. Bolt smashed world records in the 100 and 200 metres at last year's Beijing Olympics and at this year's world championships in Berlin where he also won gold in the sprint relay.